Both of these work tools let you create, share, and collaborate on documents—just not equally well. 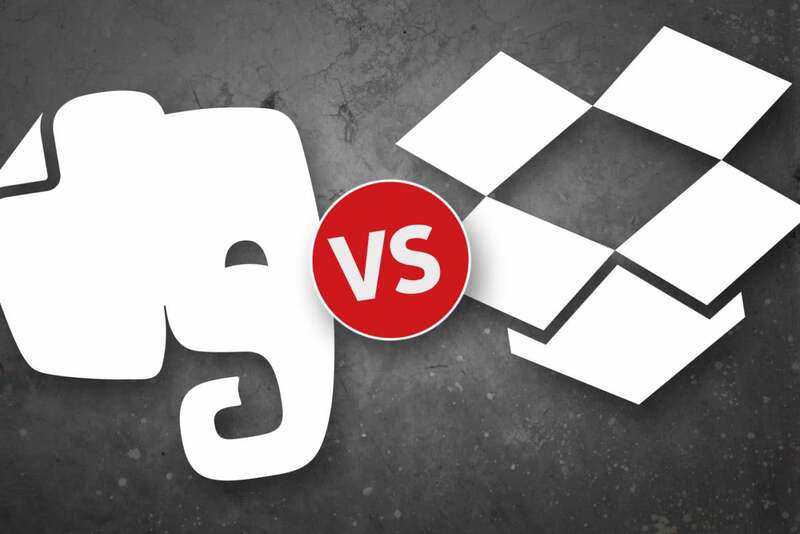 Dropbox and Evernote have frequently been pitted against each other over the years. It’s never really been a fair comparison. Dropbox, essentially just a big storage box for your files, could never compete with Evernote’s document-creation and organizational capabilities. Now that Dropbox has entered the online document-creation game with Paper, though, it seems more appropriate to see how the two services stack up against each other in a few key productivity areas. There’s no “best” option here—each tool has strengths and weaknesses and once you get familiar with them, your needs will dictate which tool is right for you. Evernote is geared more toward note taking than creating complex documents, so its text features are understandably spare. There are no tools for line spacing, indentation, or headings. You still have a choice of fonts, though, along with emphasis options, bulleted and numbered lists, checklists, and alignment. Dropbox Paper offers basic formatting options when you highlight text. With its emphasis on document creation, you might expect formatting to be front and center in Dropbox Paper. That’s not the case. There is no fixed formatting toolbar as you’d find in Evernote or a word processor like Google Docs or Microsoft Word. Instead, the text editor appears as a floating ribbon only when you highlight selected text. It includes one emphasis option—bolding—along with strikethrough, bulleted and numbered lists, and H1 and H2 tags. 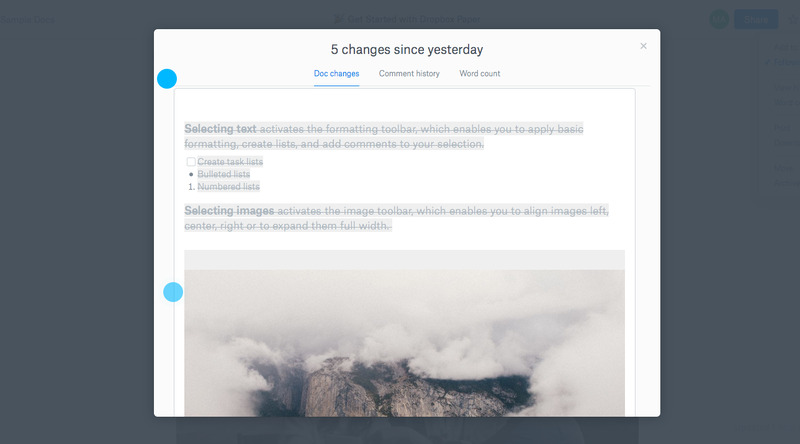 You can also add links, convert text to checklists, and add comments. Additionally, both Evernote and Dropbox Paper have options for simple tables. Both Evernote and Dropbox Paper make it easy to add images to a document. In either program, you can simply drag photos from your desktop or hard drive into the document body. Working with an image differs slightly in each, though. In Evernote, you can rotate, crop, and annotate images with text, lines, and shapes. You can also reposition an image by dragging it within the document text. You can annotate images in Evernote with lines, shapes, and text. Dropbox Paper doesn’t support any image editing, so you need to do it in a third-party app before you add the photo to your document. Once an image is inserted, you can drag it to change its placement. If the image is left-or right-justified, the text will automatically wrap around it; if you place it between two paragraphs it will display full width. Double-clicking on any image will open a full-screen gallery view of all the images in your document. Both Evernote and Paper support a variety of rich media, though which types and how you add them differs. You can attach most any type of file to a Note in Evernote—word docs, spreadsheets, and presentations; PDFs; video, audio, and graphics files; and more. Just click the familiar paperclip icon to upload the file or drag it directly into the Note. You can also record audio directly to a note using your computer’s microphone or add a photo directly from your webcam. 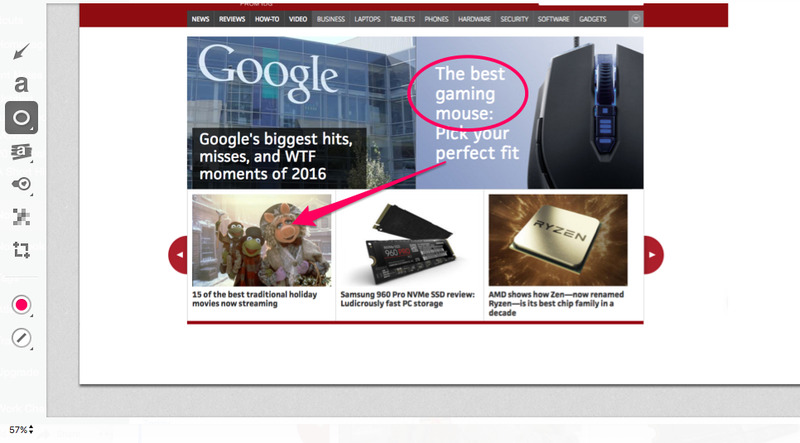 In Paper, you can add rich content to your document just by pasting a link to the file. In addition to Dropbox, Paper supports media from a variety of popular services including YouTube, Spotify, Vimeo, Soundcloud, Facebook, and Google’s productivity suite. Once the file appears, you can delete the link for a cleaner display. Sharing notes works similarly in Evernote and Dropbox Paper. In Evernote, you can invite people via email to access a note by right-clicking on it and selecting Share Note. Enter the person’s email address and a message in the chat window that appears, select the appropriate permissions—to view, edit, or edit and invite—and send the invitation. Alternately, you can copy and paste the note’s unique URL in any application. In either case, the recipient will always have access to the latest version of the document. You can invite collaborators to share any note in Evernote. Paper also allows you to invite people via email from within a document. You just click the blue Share button in the top-right corner and enter your collaborator’s name or email address in the drop-down box. Then click Link settings to choose who can view the document (anyone with the link, or just the invitee) and what they can do with it (edit or only comment) and send. Creative collaboration is Paper’s marquee feature, and it provides a variety of ways to work effectively with others in real time. You can make any content immediately visible and accessible to a specific collaborator with “@mentions”—just type @ followed by their name. You can also use @mentions to create and assign task lists within a document. 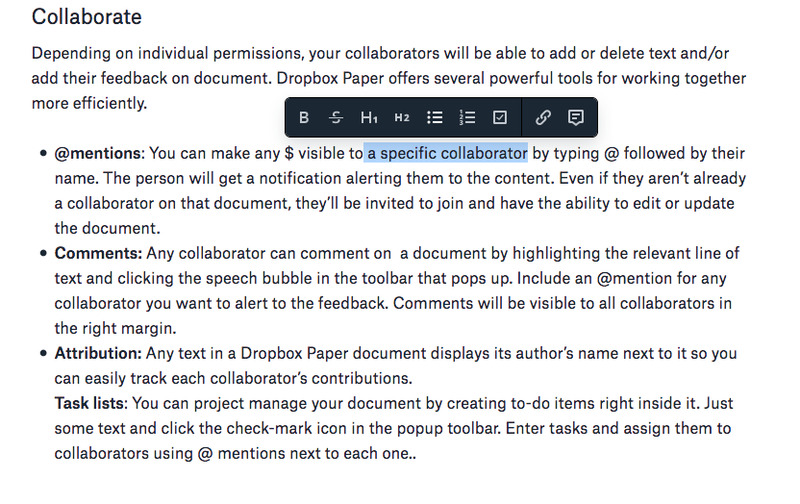 And Paper boasts essential collaboration tools including comments, editing attribution, and revision history. Paper’s revision history makes it easy to track who made what changes to a document. Evernote has its Work Chat feature, which allows you to share notes and notebooks with others, as mentioned above, and send chat messages within Evernote. While this can certainly be used to work together on a document, it can’t match Paper’s robust real-time collaboration features.